Initially Youtubers with more 10,000 subscribers will be able to live stream on Youtube using the mobile app, and the functionality will trickle down to other people soon. Youtube had the live streaming option since 2011, but the functionality was missing from its mobile application. 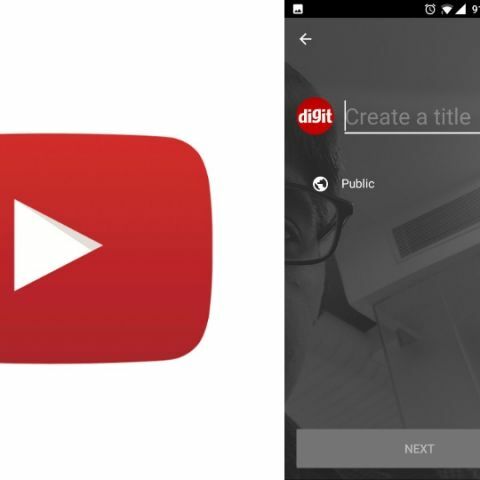 So, in its latest update, youtube is adding live streaming to its mobile application. This will allow youtubers to go live directly from the phone, similar to how Facebook live works. Along with the live streaming functionality, Youtube is also launching Super Chat feature. This is a live stream monetization tool, which will let any fan watching the stream get creator’s attention by purchasing chat messages, which are highlighted in bright colours during the stream and remain pinned on the stream for up to 5 hours. Note: Live streaming functionality is currently available to youtubers with or more than 10,000 subscribers. The functionality will be available to other people soon after. A huge focus for us here at YouTube is to find new ways to let creators and viewers interact with each other and the videos they watch. And that's why we’ve supported live streaming since, well, before Beyoncé even had a baby – way back in 2011! And in 2016, we witnessed the most-viewed political live streams of all time – the 2016 U.S. presidential debates – and we launched the world’s first 360-degree live streaming support with full 4k video, at scale and for free. So what’s next? The roll out of our new mobile live streaming feature to every creator with more than 10,000 subscribers (the rest of you will have it soon!). It’s a launch that’ll put the power of live streaming in the hands of hundreds of thousands of talented creators, giving them a more intimate and spontaneous way to share their thoughts, lives, and creativity. Mobile live streaming has been built directly into the YouTube mobile app. All you have to do to start streaming is open YouTube, hit the capture button, and you’re live! Streamed videos will have all the same features as regular YouTube videos. They can be searched for, found via recommendations or playlists, and protected from unauthorized use. Our mobile live streaming uses YouTube’s rock-solid infrastructure, meaning it’ll be fast and reliable, just the YouTube you know and love. And we’ve been working hand-in-hand with hundreds of creators to refine the mobile streaming experience while they stream from a boat or take live calls from their fans. Based on their feedback, we did things like slowing down live chat (it turns out receiving 2,000 messages per second is a little too fast!) and pushing for better streaming quality across devices.